People are often off-put by the idea of ordering a chameleon online. The idea of ordering an animal online and having it shipped to your front door in a box like a pair of new shoes seems a little unsettling. Dangerous or unethical, even. 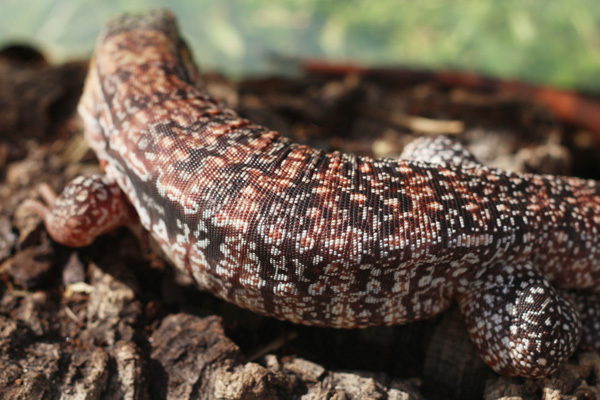 However it's actually an incredibly popular way for people in the Herp world to buy and sell animals that they wouldn't otherwise have access to. And as long as the person doing the shipping takes all the necessary responsible steps for a safe ship and the buyer takes all the necessary steps to ensure a safe delivery, it's something that carries little risk of going wrong. That said, even for a veteran like me it is still a nail-biting experience! Between the excitement of waiting for a new pet and the nerves of making sure it all goes right, I'll admit it can be a sleepless night. But it is also an extremely easy and normally smooth experience, and I'm going to show you how. This last year, 2016, has been the first year in a long time in which I haven't had a chameleon (or two, or three) to care for. After my dog got sick I didn't want to focus on anything but giving her as much quality time as possible, and once she passed I didn't really have the heart to care for reptiles in general again. But I dipped my toes in the water again with geckos and I'm at a place now, with 2016 rolling (finally) to a close that I have the room and the time and the heart to welcome a chameleon home again. I thought long and hard about what species I would want to reenter the hobby with. A Meller's again, perhaps? 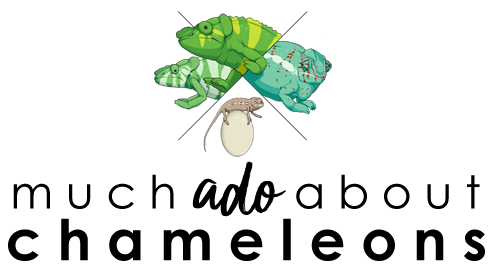 They are still my favorite but I need a chameleon that I can handle and use for educational demonstrations, and a Meller's was not going to fit that bill. Something new, perhaps, like a K. multituberculata! They'd always been on the list. But my warm little reptile room wouldn't have suited a cool species like that. Oustalet's were also on my list and have the temperament of a panther chameleon but I didn't have the kind of room a big male would need. So I settled finally on a panther, and after searching all the breeders I could think of I finally laid eyes on the perfect animal on a Facebook ad I saw purely by chance. A breeder I was not familiar with, here in Florida, was letting go of a solid blue and red Ambilobe male and I knew he had to be mine. Enter Rich at Wild Side Chameleons, in Dunnellon, Florida. The ad that sold me on my perfect chameleon. Anyone that knows me knows I love red and blue together. 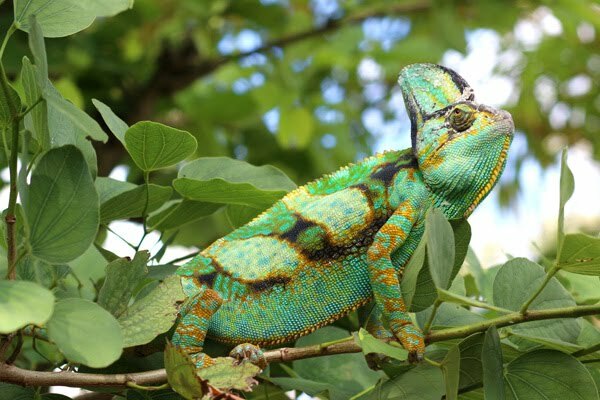 I reached out to Rich, who answered any questions I had, showed me a few other available animals, and showed me older siblings to the chameleon that had originally caught my eye. I still liked the original Ambilobe I saw, he assured me this guy was friendly and with that I was sold. I need a calm animal that I can condition to gentle handling for education purposes, after all. Once I was satisfied that this was my new chameleon I asked Rich to send me an invoice to my Paypal. 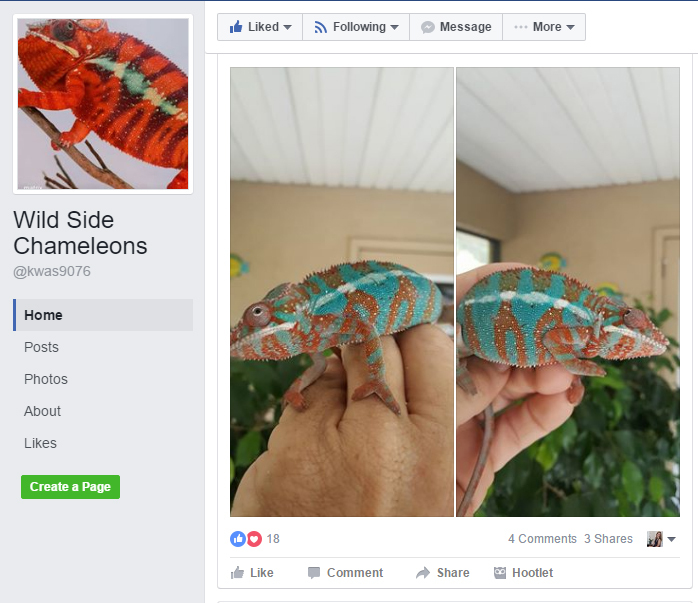 Wild Side Chameleons operates out of Facebook, but many breeders have a website with a store function built-in so you can order and pay for a chameleon directly through the website, thereby saving a step. When purchasing an animal online it's prudent to make sure you know what the breeder's policies are as far as guarantees, like 7-day health guarantees, etc. 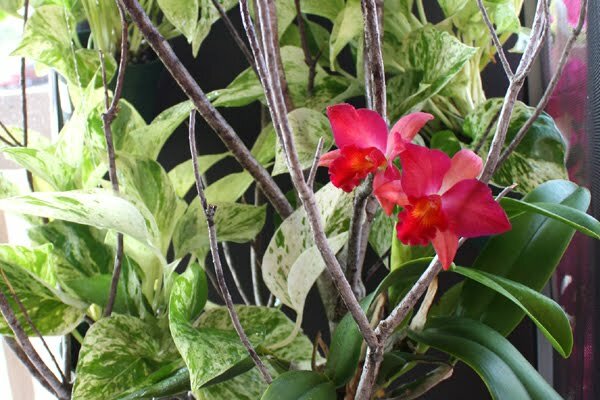 A reputable breeder should be able to stand behind the health of their animals and guarantee that they will work with you to fix any issues should any arise. 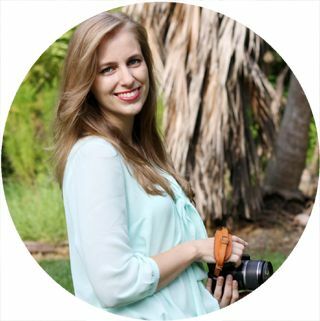 The trick to purchasing online is simply to make sure you're working with responsible, experienced people. 1. An experienced shipper knows that you never, ever ship around the weekend. This is asking for trouble if the package gets delayed for whatever reason and the animal sits in a box over the weekend until shipping resumes on Monday. Be wary of anyone whose shipping policy isn’t to ship only Monday, Tuesday, or Wednesday for next-day 10:30am arrival. 2. An experienced shipper will also work with you on when to ship out, so that you are prepared to receive the package. Rich and I agreed Monday for Tuesday delivery so I was ready to receive him. I also chose to have him shipped to my workplace, where I know our packages are treated as a priority as a major company in this area. I was given proof of shipment in the form of a photo and a tracking number. Note: I highly recommend shipping to your nearest FedEx/UPS hub, too. Usually you can pick up the packages really early because the packages are usually there before 6am. So if you’re worried about the weather, or being home to wait for the truck, choose this option and you can get your package much earlier. It saves the chameleon from bouncing around in the truck until mid-morning, too. 3. An experienced shipper will also look at their weather and yours and plan accordingly. All reptiles have to be shipped in secure, insulated boxes but depending on the temps along the journey the shipper may add either a hot pack or a cold pack. They should not be using alternative things like hand warmers. If the overnight or next day temperatures are too low or too high, even offset by the heat/cold packs, the shipper may recommend waiting until the weather gets better. Make sure you check as well and question it if the shipper is willing to send the animal in -20°F winter weather! And as far as your homework, double and triple check that the address you gave the shipper is correct. Make sure you gave the right address (not your home when you meant to give your workplace, etc.) and that it is spelled correctly, with all the right numbers. Make sure that FedEx or UPS don't have any excuses for messing up the delivery. Armed with my proof of shipment and my tracking number, now I wait. 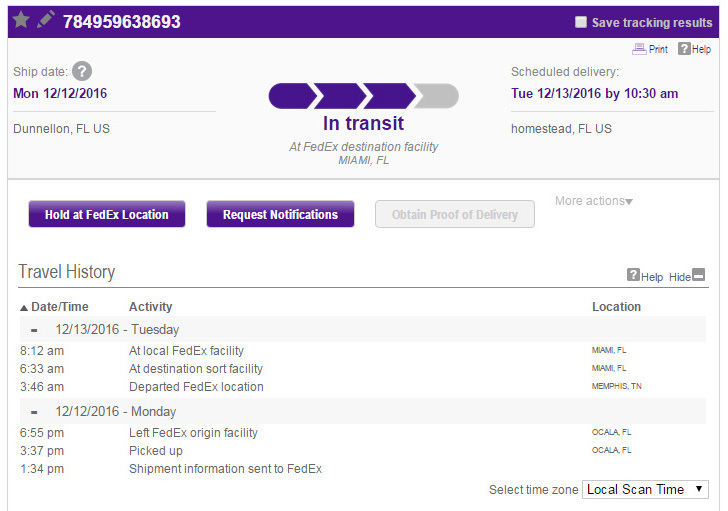 And check the tracking number occasionally to make sure it’s moving along properly. So finally 10:30 the following day arrives. You want to make sure to inspect the box and document anything that seems iffy with photos, just in case. Perhaps the shipper did something wrong with the packaging, or perhaps FedEx/UPS beta up the box – whatever the case may be, document it with photos in case you need to show proof of a bad delivery. Note: If the delivery is not there by 10:30 am you can get your shipping money refunded. Call the shipping company and figure out where the animal is and what the delay might be, of course, and coordinate the fastest delivery possible. A safely-shipped animal should be fine even if the delivery is delayed a few hours. Mine arrived a little late, almost at 11 am, but everything arrived well in order. Below are some photos of the unpackaging process! The box, with no dents or holes from rough shipping. Once I removed all the padding I see a well insulated box and a snake bag, securely tied. And the man of the hour himself, eager to get out of the snake bag. I look him over and everything is in order. A couple small scuffs from shipping are normal, especially from rubbing their nose on the bag. But he's safe and sound. And that's it! The next step, once you've looked over your new purchase and are satisfied that everything looks in order, is to put him/her in their new home and give them a much needed drink, time to bask, and privacy. Rarely do new chameleons want to eat the day they arrive so don't worry about that. Just remember that they have been rolling around in a dark box all night and most of the morning, so all they want is to bask, relax, and at most have a little water. Allow your new addition to settle in a few days before messing with them! I know it's super tempting to start handling them and showing them off but give them a bit to adjust. And that's it! That's really how easy it is to ship a chameleon overnight. Now for a name for this guy! 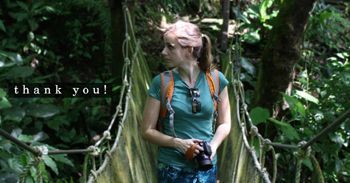 Nice to see your experience in purchasing a chameleon online and how it is definitely okay! i've seen so many people fighting how it's awful but they have to get to the pet store somehow...I worked at a large pet store chain and they are pretty bad at how they 'package' their animals for shipping. Good breeders will put lots of care into shipping their critters. But then I always stress at just transporting my reptile to the vet haha. Exactly Ashley, of course there are unethical people out there and I've seen some shipping horror stories. 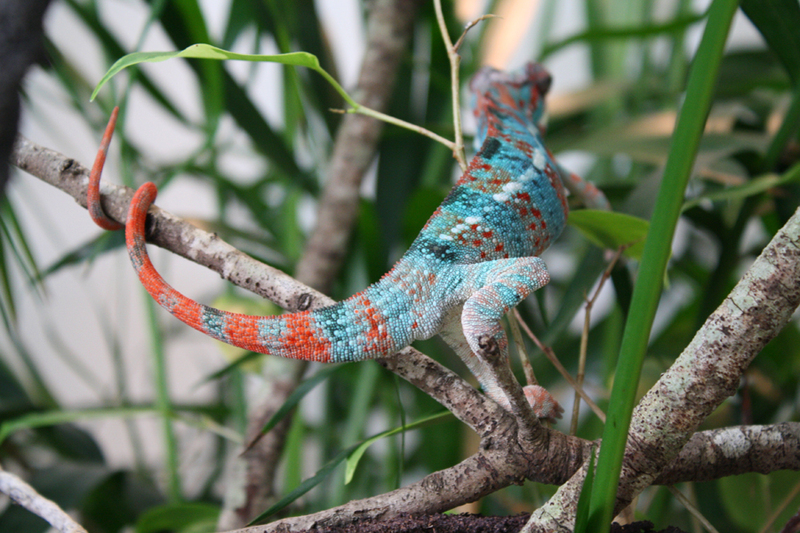 But if you choose a good, reputable breeder then there is no reason the chameleon shouldn't arrive in excellent shape. And it gives you the option of going with a healthy animal from a breeder instead of just going to your local chain pet store, where the animals may be more sickly, just because that's all there is in your town. It's not so dangerous, and if safely packaged the chameleon will just close its eyes and try to sleep. Mine has only been here one day and is already settling in beautifully, so it wasn't that terrible of an ordeal as far as he's concerned lol.